Tanya Lee holds a B.A from the University of British Columbia in literature and political science, and an MSc. (Planning) in international rural planning and development from the University of Guelph. With a focus on international development and human rights, Tanya has worked on counter-trafficking, safe-migration, and maternal and child health projects in India, Nepal, Mexico, Haiti, and various countries in Africa. She also acts in independent films, particularly those with a focus on human rights and gender equality. She currently lives in B.C. with her husband, her daughter, and a belligerent 23lb orange tabby named Frank. The Wolf and the Rain is her first novel. 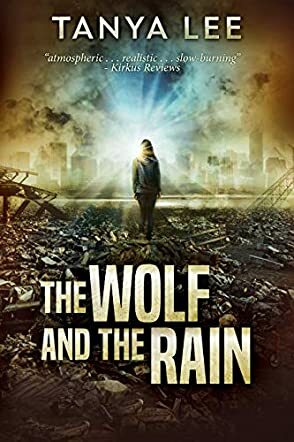 The Wolf and the Rain is an exciting work of dystopian climate fiction by author Tanya Lee. With a fantastic mix of traditional gangster action and a modern, intelligent sci-fi disaster, the story centers on a southern soldier named Samarra. As the aftermath of global warming continues to ravage the dried-out south, Samarra races north for any hope of survival. In the Barrow, she soon realizes that water isn’t the only thing she needs to worry about. Here, Samarra uses her skill set to work for the Vanus, a powerful family amongst the gangs of criminals that roam the streets. Here too she encounters the legendary Raina, the woman in the job before her, and a whole new obsessive investigation begins. I can’t praise this book enough for the inventive genre twisting, blending and superbly diverse themes it contains. Tanya Lee is part of a fantastic movement in fiction towards inclusivity and intelligent, modern themes, all whilst delivering us an exciting and fast-paced gangster novel for the post-modern age. Sam’s character is strong and wise but appropriately flawed for a hero, and her adventures dealing with the gross, wet, diseased city of the Barrow are vividly brought to life through descriptions and her inner feelings. The readership of the book is definitely young adults nearer to the adult stage, and the LGBT themes make a realistic and heartfelt addition to the tale overall, without making it the central issue of the story. Overall, The Wolf and the Rain is a superb read that holds much promise for the future of science fiction.